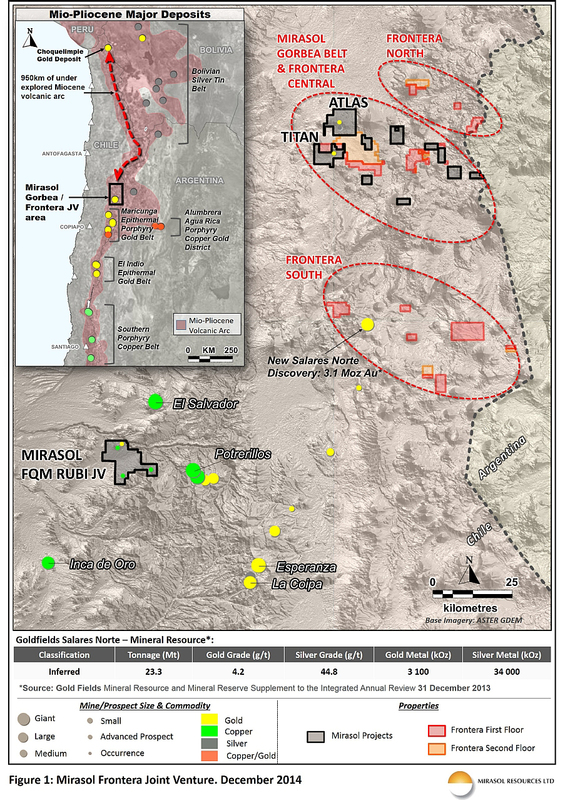 Mirasol initiates reconnaissance program on Frontera JV in Mirasol’s Miocene Arc generative program in northern Chile, targeting large epithermal gold and porphyry copper deposits. The Frontera JV encompasses 15 early-stage claim blocks covering approximately 22,400 hectares, including claim blocks that are contiguous with Mirasol’s 100%-owned Atlas and Titan Projects. Satellite image analysis shows large-scale alteration systems and prospective structural settings within some of the claims that are analogous to other prolific Mio-Pliocene age precious metal and copper mineral systems in the belt. Mirasol Resources is pleased to announce that it has initiated its field reconnaissance program for the Frontera JV that encompasses an underexplored section of the highly prospective Mio-Pliocene age volcanic arc of northern Chile. A chain of world-class gold and copper deposits occurs along an 850 km length of the Chilean / Argentine Mio-Pliocene volcanic arc (Figure 1). These deposits stretch from the giant El Teniente copper mine in the Southern Porphyry Belt through to the La Coipa and Esperanza silver-gold mines at the northern end of the Maricunga Belt. In Chile, the Miocene volcanic arc extends a further 950 km northwards from the Maricunga gold-copper belt before encountering the next notable deposit of Miocene-age mineralization, at the Choquelimpie gold mine. This northern segment is underexplored but hosts numerous large scale alteration systems; however, until recently exploration had not identified large Mio-Pliocene age metal deposits in this area. The Frontera JV lies within the northern segment and encompasses a portfolio of 15 claim blocks totalling approximately 22,400 hectares, situated between 50 and 170 km north of the Maricunga gold and copper Belt. This section of Mio-Pliocene volcanic arc has become the focus of recent exploration activity following Mirasol’s announcements in early 2013 of widespread, outcropping, gold and silver mineralization at the Titan and Atlas projects, and the late 2013 announcement by Gold Fields Ltd. of their Salares Norte project (3.1 million ounce gold resource, grading 4.2 grams per tonne (g/t) Au). The Frontera claim blocks fall into 3 geographic groups; Frontera North, Central and South located at mean altitudes of between 3,630 to 4,950 metres. While challenging, these altitudes compare favourably to those of Kinross’ Maricunga and La Copia open cut mines in the Maricunga Belt of the Chilean cordillera. The Frontera Central claims are located within the Gorbea Belt where Mirasol has optioned 100% of nine claim blocks totalling approximately 20,700 hectares. In some cases, the Frontera Central Claims are contiguous with Mirasol’s 100%-owned claims including the Titan and Atlas projects. This season’s exploration will focus on the Frontera North and South groups. Many of these claims have had little to no previous exploration, presenting the potential for the discovery of new outcropping mineralization. While some Frontera claims blocks have good access, some claims are located in remote and logistically challenging areas. In preparation for the field campaign Mirasol has designed a detailed exploration program and logistical plan, including an in-depth alteration and structural interpretation using Aster and high-resolution satellite imagery, which will optimize on-the-ground reconnaissance sampling programs. The 2014 summer field exploration campaign was initiated in early November with the first-pass sampling of the Frontera North and South claims blocks scheduled for completion by February of 2015. The Frontera JV Deal terms. On 26 June 2013 the Company announced a definitive exploration and option agreement (the Frontera JV) with an arms-length private Chilean company, to explore a portfolio of prospective early-stage mineral properties. The Frontera JV provides for Mirasol to earn a 51% interest in any, or all, of the exploration properties by expending US $3 million within a four year period which commenced on December 26, 2012, of which US $300,000 was committed to be spent in the first year (completed). After vesting, each party will contribute in proportion to its equity position. Should a discovery be put into production, a 1.5% net smelter return royalty (“NSR”) is payable by Mirasol to its venture partner from Mirasol’s percentage of production, capped at 51% of attributable production. If either party dilutes below 10% interest, its ownership will convert to a 1% NSR. Stephen Nano, President and CEO is the Qualified Person under NI 43-101 who has prepared and approves the technical content of this news release. Exploration on the Frontera JV is supervised by Stephen C. Nano, who is the Qualified Person under NI 43-101, Exploration Manager Timothy Heenan and Principal Geologist Leandro Echavarria. All technical information for the Company’s projects is obtained and reported under a formal quality assurance and quality control (QA/QC) program. All drill, rock chip and stream sediment samples are collected under the supervision of Company geologists in accordance with standard industry practice. Samples are dispatched via transport to an ISO 9001:2000-accredited laboratory in Chile for analysis. All drill and rock chip samples are submitted to the Laboratory with independently sourced, accredited standards and blanks and where appropriate duplicate samples to facilitate monitoring of laboratory performance. Certified Results are examined by an independent qualified consultant to ensure laboratory performance meets required standards.